This year for my kids' school teachers we painted some dish towels. 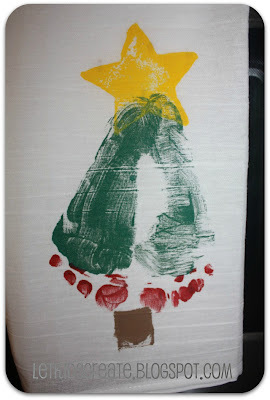 Inspired by this pin on Pinterest, I decided to go really simple and use my girls footprints to make some Christmas trees on the towels. I recommend that you put a piece of wax paper or something that won't stick to paint behind the surface you are going to be painting on. For some reason, I thought newspaper would work well for this. Maybe it would have been alright if I had peeled it away right after we finished painting. But . . . I let the paint dry before peeling it off so there are some newspaper bits stuck to the back of these towels (I imagine it will dissolve once they are washed). Oops. Alright, I had one girl at a time doing this. I had her sit in a chair while I painted the bottom of her foot using the sponge brush - they loved this part because it tickled. I painted the foot green and the toes red. Then I positioned her foot over the towel and had her stand up to get a good impression on the towel. You can see the side of the tree we did without having her stand up. It didn't leave as dark of an impression. Then we repeated with the other foot. They all thought it was so funny that it looked like they had little grinch feet when we were done because acrylic paint doesn't come off the skin too easily. After the main part of the tree was done, I used a star sponge we had on hand (from the dollar store) and had them stamp it on top of the tree. They used the sponge brush with a little bit of brown paint to make a little trunk. And no, my daughter does not have 4 toes on the one foot. Her second toes on both feet like to stick up a bit, I didn't realize it until after the first footprint. So for the second foot, I pushed that toe down. Lou decided after she had done the tree that she wanted to make a reindeer also using her handprint (completely her idea, by the way). 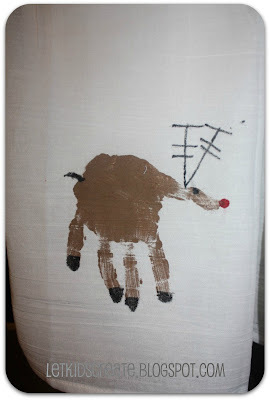 We used the brown paint to cover her hand in paint, then stamped it onto the towel. She used a cotton swab to dot the nose and used a paint pen to finish off the details. After letting the paint dry for 24 hours, I heat set the designs with the iron by pressing for 30 seconds. They should be good to wash and use now! I am happy with the way these turned out so I think we may make a few more for some lucky lucky grandparents . . .
What gifts are most meaningful to you? What are you giving to your children's teachers this year? Linked up to NurtureStore Play Academy﻿. This is waaaaay cute & CLEVER!! Love it! What a wonderful idea to give to grandparents!! I would love for you to come link up at my TGIF LInky Party - http://livinglifeintentionally.blogspot.com/search/label/Linkey%20Parties - you always have such cute stuff I know my readers would love to see!! 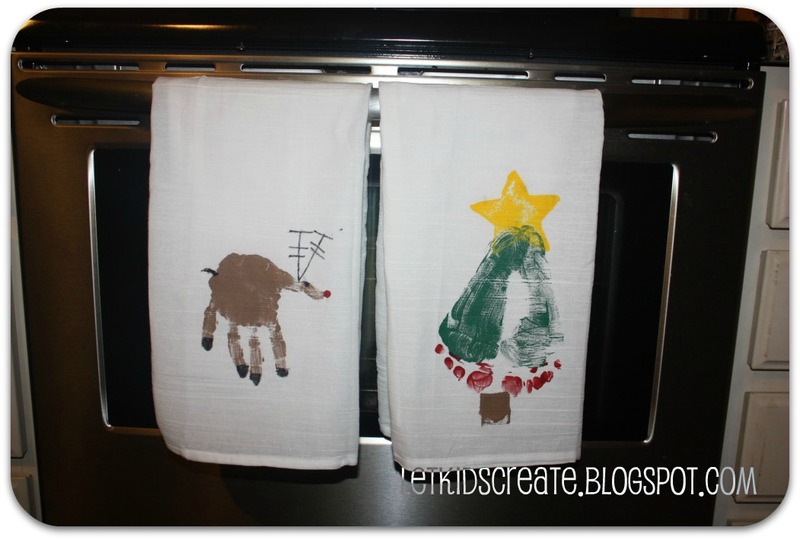 How cute to make tea towels! Absolutely adorable! wonderful gift idea...I really like it. I have been looking all over for these types of towels. I can't find them at the dollar store either, so where else should I look? Thanks! Sometimes these flour sack towels are hard to find in stores. I have added this item to my Amazon widget on the sidebar. Good luck on your project! i was able to find a 5 pack of the towels at walkart for about $5. Are the towels washable after you print them??? Yes, once the design is heat-set with your iron (pressing on the wrong side for about 30 seconds), the towels are cometely washable. The fabric (textile) medium added to the acrylic paint will also make the painted designs soft like the fabric, and not stiff. These look fantastic! Do you mean the back of the towels on the opposite side to the paint is the wrong side? Earlier I see you suggested placing a thin piece of cloth (like a pillowcase) over the design, and I assumed that meant over the top side of the painting? Will both ways set the paint? Sorry for the confusion, I did say two different ways to heat set it. Either way will work, the painted area just needs to have heat set to it for 30 seconds. The first method I mentioned, ironing it design-side-up with a cloth over the top, is how I heat set the design on this project. 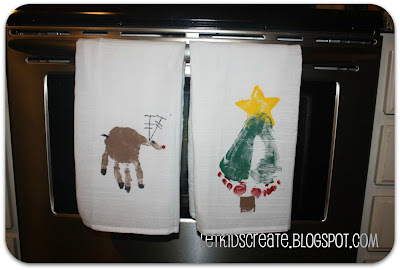 I found the towels at Target 4 pk/$3...... about to make these with my students. Even better than the dollar store! Last year they seemed to be a lot more difficult to find when I went back to buy more towels to make more gifts. Can't wait to make some grandparent gifts! You said to use acrylic paints with fabric medium at a 2:1 ratio. Which is the "2" and which is the "1"? 2 parts paint to 1 part fabric medium (it may say "textile" on the bottle). Good luck with your project! I love this and will definitely be making a few over the next few days for gifts this Christmas! I am thinking of adding thumb print "ornaments" to the tree. .. .. Thank you for the wonderful idea! I love the idea of adding thumbprint ornaments! Did you wash the towels prior to the craft? I didn't wash mine. I think either way would be fine. They would probably need to be ironed after washing if you were to give them as a gift as they would be rather wrinkly. Do I have to use fabric medium With the acrylic paint? Sorry for the delayed response. You don't have to use it, but fabric medium will make the paint softer and more flexible. A must read post! I couldn’t resist commenting. Well written! I love these and have used since my grandmother did the stitching.My kids now love them and I replenish their supplies on birthdays and holidays.Thank you.